Succulents are fun, nearly care free and reproduce relatively easily on their own. They can make excellent ground covers and are just as interesting and easy to care for in pots and containers. Succulents, unlike cactus, have no spines, thorns or spikey daggers. The native habitat of the Rio Grande Valley has its own variety of succulents. 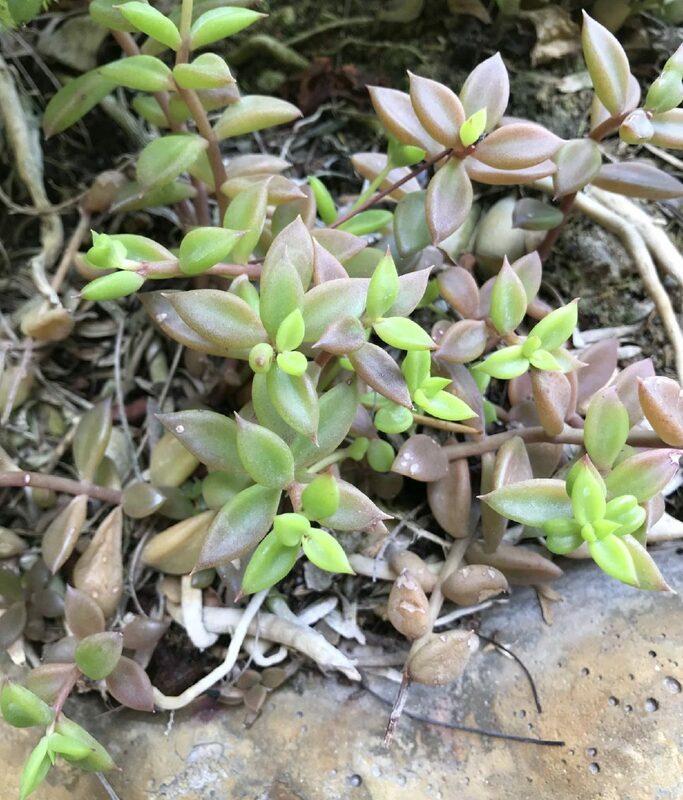 One of the more popular species, although becoming harder to find, is Texas stonecrop (Lenophyllum texanum) [Sedum texanum], in the Crassulaceae family. Sedums, also called stonecrops, are plants that have thick fleshy leaves, fleshy stalks and clusters of white, yellow or pink flowers. They generally root wherever they touch the soil. Alternately, their leaves fall easily and take root, forming new plants. Texas stonecrop is a creeping variety of sedum. It is a perennial and excellent in a rock or succulent garden or as a ground cover. Its native habitat includes the coastal plains, to the thorn scrub in the lower Rio Grande Valley and west. A caution if used as a ground cover, rabbits and tortoises eat this plant. Consider growing it in a container where it will eventually spill over the sides. Whether in the ground or a container, a very porous soil is impor-tant; good drainage is a must. Stonecrops can get sun scald in extremely hot, dry Valley conditions. They can successfully be grown in partial shade. Texas stonecrop blooms in winter with very small, inconspicuous yellow flowers on upright slender spikes. It propagates easily from seed, cuttings, and fallen leaves or rosettes. It is host plant for Xami Hairstreak butterfly (Callophrys xami). Another succulent prevalent in the valley is one you may already have and perhaps have disregarded as an unwanted weed. 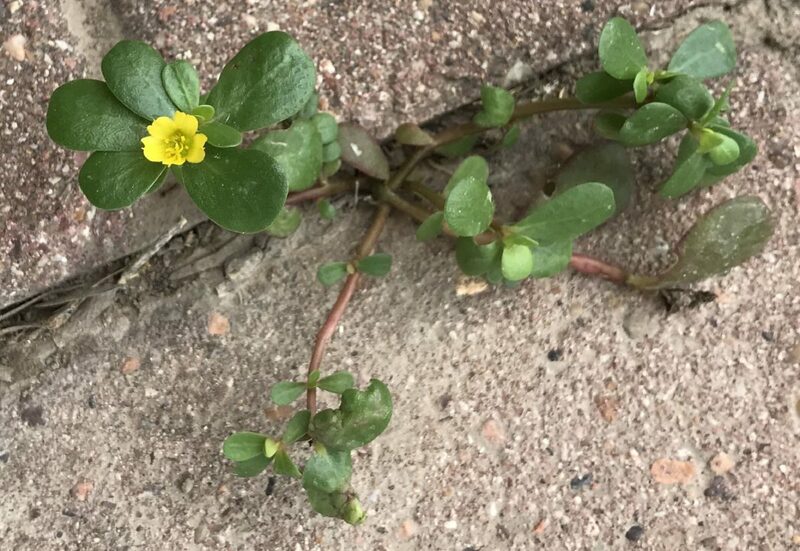 Common purslane (Portulaca oleracea), a species in the Portulacaceae family, also called verdolaga, often sprouts in sidewalk cracks, between patio pavers and other unplanned places in the garden. There are two varieties, upright and prostrate. The stems of the prostrate species are hairless and can be as long as 12 inches. It blooms spring through fall. The flowers are tiny and have five yellow petals and yellow anthers. The flowers produce a many-seeded fruit. An annual, it comes up from a taproot and does not root at the stem nodes. A more familiar Valley species in the Portulacaceae family is chisme (Portulaca pilosa). 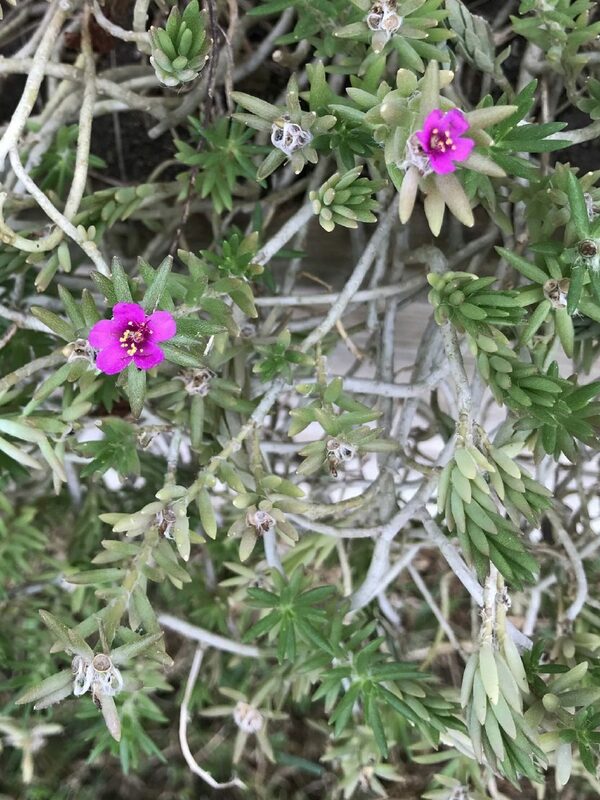 Sometimes confused with its close cousin, moss rose, chisme is a prostrate succulent ground cover that blooms with purplish-red flowers spring through fall. The stems can reach to six inches in length. They are matted with white, wooly hairs. It is an annual, from a taproot. Chisme likes partial shade to full sun and does well in rocky soil. The flowers provide nectar for small butterflies. The fruit is a tiny, many-seeded capsule, and when ripe, the seed pods can be pinched, scattering the seeds where you’d like to see the plant reproduce. These three plants are excellent specimens for xeriscaping and good candidates for container gardening when planted in a fast-draining variety of potting soil. Anita Westervelt is a Texas Master Naturalist who provides monthly stories for The Monitor.